In the previous blog post by Anu the meaning of motivation in learning was addressed and gamification was offered as a solution for motivation. In this article, the issue of motivating different types of learners is discussed. By different types of learners here we don’t mean the traditional classification of learning styles (auditory, kinesthetic, etc.) which Anu has already issued in her prior blog post. When game elements are used to motivate learners, one first needs to find out what kind of people will “play the game”. 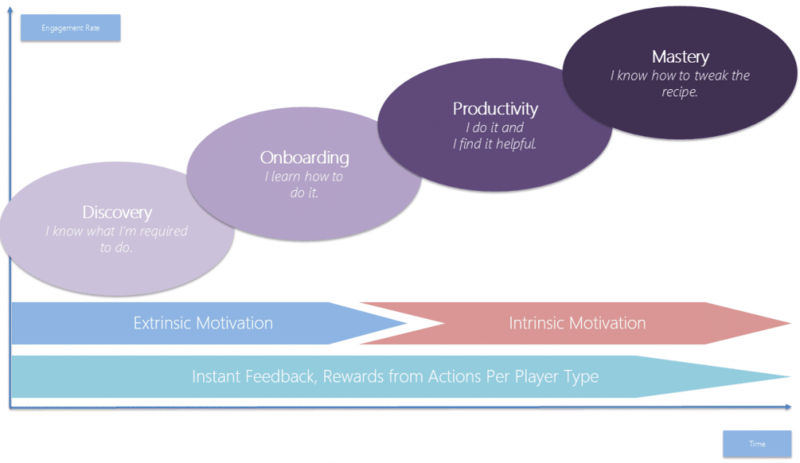 From Richard Bartle’s classic player types Andrzej Marczewski has derived four different user types that are an asset when trying to find out ways to increase motivation with gamification. For Free Spirit it is important to discover new territories and places and create new things. He’s motivated by autonomy. Socialiser wants to socialise rather than play the game itself. It is important for him to interact with other players and he’s motivated by relatedness. Philanthropist wants to help and offer unselfishly his help and even points to other players. He is motivated by purpose. In order to make the information system as useful as possible and into active use, one must take into consideration the different motivation factors of different user types. This has to be done both when taking the system into use and when the system is in production use. Traditionally on-site training is held in order to get the personnel to use the purchased system and to make sure they use it right. With the traditional training the maximum benefits for the organization or personnel are not usually gained. When the system has been taken into use and trainings have taken place, the user should be lead to the path of constant self-learning by motivating her. Little by little the user gains confidence, new skills and eventually knows how to apply the things she learned into different needs. The user’s journey towards the complete mastery of the system goes through four steps (see picture above). First the user needs to know what is expected of her (Discovery). Is she using the system for doing her everyday tasks? How much time does the usage of the system take and what benefits are there of the use of the system from the point of view of the employee’s work? In the second phase the user has to study how to use the system in order for her to complete the tasks that are required of her (Onboarding). How to update the customer data? Where can the HR instructions be found? How to save a new deal into the system? In the third phase the user is already engaged in using the system in a productive way as part of her own work (Productivity). Using the system fits in naturally into my work routines, it is easy and offers me benefits all the time! In the fourth and last phase the user is able to apply her know-how, help others and develop the system (Mastery). I understand how the advanced features of the system work and other employees ask help from me. In the first two cases users can be motivated with extrinsic motivators like rewards and points, but in order to reach the productive level, the user has to find the system meaningful to herself. This can be attained by using intrinsic motivation factors, like offering meaningful challenges, a sense of control or the possibility to boost the user’s status. For example SharePoint’s default features make it possible to bring simple game elements into the use of, for example, intranet (see also Jussi’s blog post). From usage reports it is easy to look who visits the site most and rewarding that motivates players of the achiever type. Encouraging people to discuss, update their own personal information, commenting as well as adding tags and rewarding those motivate the socialiser player. Philanthropists enjoy forums where end-users can ask questions and everyone are free to answer to other people’s questions. Solving shared problems increase team spirit among personnel. Community site with all its default features (points, badges, scoreboard etc.) is often a place where, in addition to philanthropist, also achiever feels like at home. For the free spirit it pays off to give her the opportunity to create new content. Also it might be a good idea to follow the visits in different sites from usage reports and reward those who explore sites carefully and visit places where the hastiest people don’t bother to visit. Perhaps it would be a good idea to “hide” a chance to win movie tickets into a site. Free spirit is sure to acknowledge that as motivating. P.s. Are you struggling with system implementations or user training? Our Habit gamification platform offers an easy tool to maximize the profit of your system investment. Do You Know Which Rows in Your SharePoint List Are Hot and Which Cold?